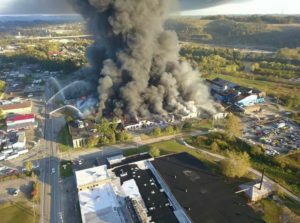 On the night of Oct 21st 2017, a 420,000 square-foot facility known locally as the Ames Plant caught fire in the city of Parkersburg, WV. Incident Command was quickly established and our Mobile Command Vehicle deployed to the scene to assist with the massive blaze. For nine days our teams of dispatchers worked on scene to help coordinate communications with not only our local fire and public safety agencies, but with numerous out of area agencies that came to assist. As the fire continued to burn on scene, those who staffed the Wood County 9-1-1 center dealt with a near overwhelming number of calls related to the incident. In addition to their dispatching duties, several of our staff are members of local fire departments and even spent their off duty hours continuing to combat the on-going fire. Dedication and the ability to adapt to whatever challenges may come are the qualities that define our dispatchers.